No.61 Mechanism of Deodorizing Effect of MCT-βCD finished Textile on Ammonia. No.44 Defining the mechanism of reduced blood cholesterol by α-cyclodextrin supplementation. No.34 Effect of Complexation of R(+)-α lipoic acid with Cyclodextrin on the Aqueous Solubility and Radical Scavenging Activity. *This research was reported in 31th Cyclodextrin Symposium (Shimane, Sep. 11~12, 2014). White radish having pungent principle is preferred as a condiment in Japan. 4-Methylthio-3-butenyl isothiocyanate (MTBI), a pungent principle of white radish has some beneficial functions such as antimicrobial effect. However, MTBI is very unstable. Rapid degradation of MTBI causes unfavorable quality problems for processed foods containing white radish like loss of pungent taste, color change and sulfurous smell. Our company has emerging technologies in functional food and personal care fields which raises the water solubility, stability and bioavailability of functional ingredients by using the inclusion property of cyclodextrin (CD). We previously reported about stabilization of MTBI by complexation with CD (* please refer to the newest result of research "62th" and "63th" of our homepage for details.). →In this study, stabilization of MTBI and pigment in grated radish sprout containing high amount of MTBI by complexation with CD was explored. Biosci. Biotech. Biochem., 1997, 61, 2109-2112. J. Agric. Food Chem., 2008, 56, 875-883.
International Immunopharmacology, 2006, 6, 854-861. Int. J. Clin. Exp. Med., 2015, 8, 15910-15919. Effect of CD on stability of MTBI in grated radish sprout. Time dependent degradation of MTBI of grated radish sprout in the absence and presence of CD (10%) at 25℃. Stability of MTBI of grated radish sprout was enhanced by CD inclusion. αCD was most effective stabilizer for MTBI. Inhibition effect of CD on the generation of Methyl mercaptan from MTBI in grated radish sprout. Amount of Methyl mercaptan generated from MTBI in grated radish sprout in the absence and presence of CD (10%) during 60 min at 25℃. Generation of Methyl mercaptan was significantly inhibited by stabilization of MTBI with αCD. 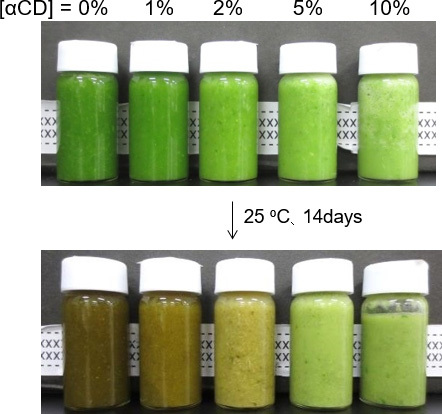 Color changes of grated radish sprout in the absence and presence of αCD stored at 25℃ under dark condition for 14 days. Stabilization of pigment of radish sprout with αCD was observed. 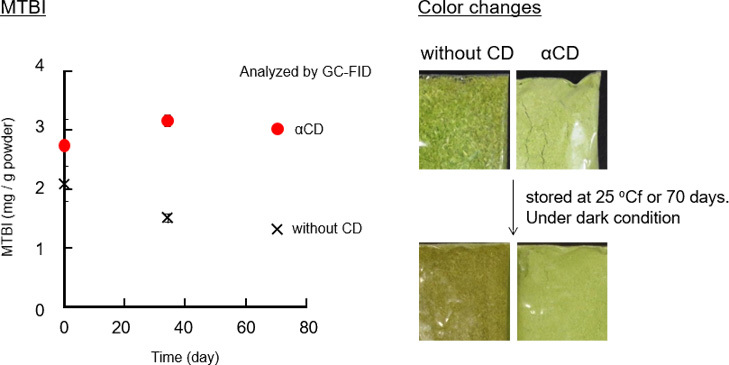 Time dependent degradation of MTBI and color changes of radish sprout - αCD powder prepared by freeze drying. Stability enhancements of MTBI and color of radish sprout - αCD powder were observed compared with control sample. Stabilities of MTBI and pigment in grated radish sprout were enhanced by complexation with αCD. Preparation of radish sprout - αCD powder containing stabilized MTBI and pigment was succeeded. ⇒αCD could be a potent stabilizer of MTBI and pigment of radish sprout for the developments of new processed foods containing high amount of MTBI. More functionalities can be added to your products by the use of αCD having many functions as a dietary fiber (* please refer to the newest result of research "42th", "44th" and "50th" of our homepage for details.). copyright 2011 CycloChem Bio Co., Ltd. All Rights Reserved.